Color: Multiple Colours in Mesh Fabric, Leather, PP Leather, Rexine, Fabric, Leatherite. 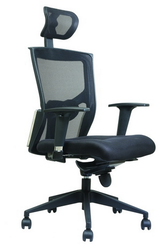 We offer 'Spine' Office Chair from Inspace India. Mavi Medium Back Chair, PU Arms, Nylon Base, Gash Lift, Seat Back Net Tapestry. Our Netted Executive Chairs are manufactured using high grade raw material. With superior designs, these chairs enhance the comfort level. Our furniture items are known for their unique designs, durability, comfort, smooth finishings and affordable prices. These chairs are also available in customized colors, sizes and designs as per the needs of our clients. High Back Chair, PP Arms, Nylon Base, Gas Lift , Seat & Back Net Tapestry. 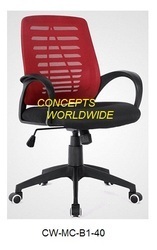 Owing to the rich experience, we have established ourselves as the most famous firm involved in offering a broad spectrum of excellent quality Netted Back Revolving Computer Chair. Our valuable customers can avail from us an attractive assortment of Designer Office Chairs within the stipulated frame of time. These products are made from high quality components.